This is not a proper post but I wanted to let you know that Penguin has posted a couple of MP3s of me reading excerpts from Summer and Bird on their website. These are just little informal recordings, nothing posh. But man I do love reading aloud, and reading my own book aloud is a much greater pleasure than I ever guessed. I should have realized how much fun it would be based on the few times I've performed short plays I wrote myself. Any actor will tell you that being able to surprise a laugh out of an audience, or make them hold their breaths, is pretty much the best thing ever. But to be able to do that when you wrote the words--no, that is the ACTUAL best. A couple of weeks ago I read aloud and talked with the 4th, 5th, and 6th graders at the Girls School of Austin. The students were delightful, warm and enthusiastic and thoughtful. And when I read the first line of chapter 6*, and the whole room GASPED? For a moment I could not believe that this is my actual job, because it is the most splendid job in the world. Oh! That reminds me -- this is not a reading, but it's a great cause, and chock full of writers more famous than me. 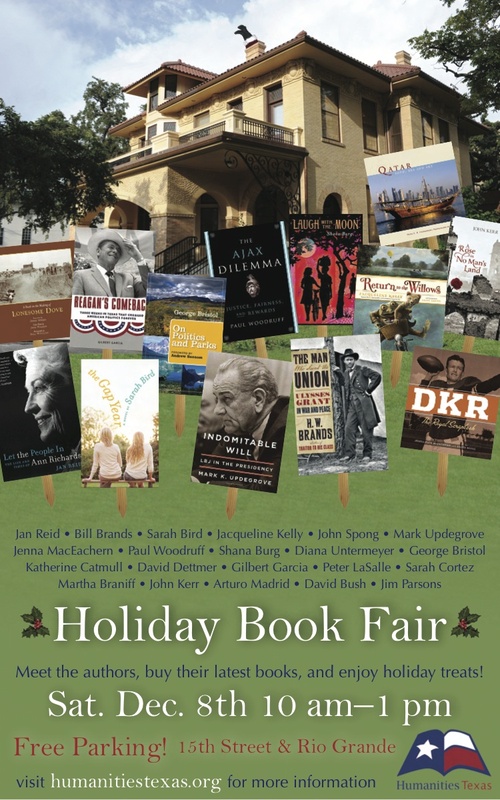 Here's a triple play where you can do good, meet writers, and knock out some holiday shopping all at once on Saturday, December 8 at the Humanities Texas Holiday Book Fair. See you there? Say yes. It's at the schmancy Byrne-Reed House downtown and: free parking! I won't be reading aloud, do not fear, but I will be signing, as will Austin icon Sarah Bird, Newbery honor winner Jacqueline Kelly (with her new telling-forward of The Wind in the Willows), Texas Monthly editor Jake Silverstein, novelists Stephen Harrigan and Oscar Casares, and more. And home baked pastries. So please come! *"The Puppeteer was full of dead birds."